Last night I made a quick dessert that incorporated fresh fruit. Now I am not one to eat fruit, but it involved a cookie so I said why not? 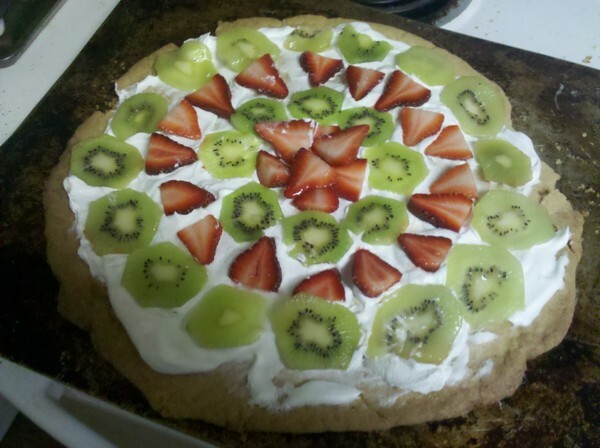 The recipe was as simple as baking a sugar cookie into a big round pizza-like shape in order to make the crust. After the cookie cooled completely I used cool-whip for the sauce. I then layered fresh fruit onto the pie. I added a sprinkle of sugar over the top just to add something sweet to the mix. All of the recipes I read stated that the sauce was a cream cheese and sugar spread, however this was much easier. This was super simple and really tasty. The edges became a little over-done compared to the squishy middle, but all in all it was great. Good thing I had a group of people to eat this, otherwise I am not sure how I would have kept the left overs fresh. Hooray for another recipe for my 101 in 1001 #67 challenge.